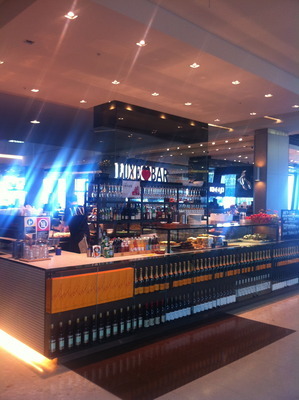 Having Luxe Espresso located at the entrance to the food court area in Westfield Bondi Junction came as a pleasant surprise. The storefront is extremely neat and inviting. Love the logo and how there is a strawberry in between the names. The image does appear to be a little 'too cool for school' or 'standoffish' at times, however never judge a book by its cover. Makes way for a trendy, sophisticated, elegant and chic bar rolled into one with alcohol service, in addition to being able to buy coffee and pastries. The staff can be friendly and polite with a twist of arrogance and forgive me; I know this does not make much sense at this stage; yet when you attend this establishment in the morning of any given weekday in particular, you might see where I am coming from here. The cakes are quite pricey and the coffee represents extremely great value, and seeing the beautiful latte art (I am kicking myself for not taking a photo for show and tell here) on my cappuccino, I want to take that 'too cool for school' attitude back as a lot of effort was put into my coffee; something that would cheer you up if your day wasn't going as planned, and might allow you to leave your Luxe experience with a massive grin on your face.